George Sheffield Junior was born on 1 January 1839 in Wigton, Cumbria, the son of a hatter and draper. He was named after his uncle, George Sheffield, a portrait painter of some repute, who had studied at the Royal Academy in his youth. At an early age George moved with his parents to Warrington. He attended the local art school where his tutors included Sir Samuel Luke Fildes RA, the renowned illustrator of first editions of works by Charles Dickens and William Thackeray. Later, George moved to Manchester where he became apprenticed to Messrs Charlie and Franks, a firm of calico printers. He proved to be a skilful designer, who worked quickly and with some finesse, but his real interest lay in his participation in painting classes at the Manchester School of Art. However, he became restless and decided to exchange city life for a career as a sailor. He made many voyages, both transatlantic and European, often visiting Holland and Belgium. These experiences had a lasting effect on him, providing inspiration for the marine art and seascapes at which he excelled. At one stage he worked collaboratively with another Cumbrian artist, Sam Bough RSA (1822-1878), on a large marine painting. In 1861, at the age of 32, George retired from the sea and became a professional artist, settling in North Wales in the Snowdonia village of Betws-y-Coed, where the first British artists’ colony was becoming established (1844-1914). In the 1800s it was a hub of artistic activity led by David Cox and H Clarence Whaite, both prominent Victorian artists. George painted prolifically, working in a large variety of mediums - watercolours, oils, pastels, coloured chalks, charcoal, pen and ink and in many different styles. He exhibited a range of landscapes and seascapes, many of which were monochrome, in Liverpool and Manchester. In 1869 he became an Associate Member of the Manchester Academy. Two years later he was elected to full membership. Early in his career George was influenced by the work of the Pre-Raphaelites and when some of his work was exhibited in a Cambridge gallery it caught the eye of John Ruskin, a fellow Cumbrian, who commented admiringly about it. His numerous studies of bushes and flowers, all created with a fine and delicate use of pen and ink and washes, exemplified his close observation of nature. Apparently, he was never without a sketchbook and preferred working outdoors. Some of his drawings were large scale and showed the influences of Constable and Turner. It is obvious he was comfortable painting both landscapes and seascapes. Very often these were set in peaceful contexts in which atmospheric effects of clouds, smoke and sunshine were created with subtle tones and a sublime delicacy. This did not mean that he could not paint rough seas as and when required. Indeed, his technical skill when painting water is there for all to see and admire. In 1880 George Sheffield moved to Harold Tower in Douglas on the Isle of Man, once the home of historical painter, Edward Henry Corbauld. He stayed there for almost four years, during which time he mentored, amongst other artists, the Art Nouveau designer and painter, Archibald Knox. His work became more impressionistic, utilising a broad, more forceful style with large, free brushstrokes. The works sold well at auction houses both here and abroad. He then relocated to Chapel Lane, Wilmslow, where he continued to work with great enthusiasm. Besides exhibiting at the Royal Academy, his work was shown at the Royal Society of British Artists, the Manchester City Art Gallery and the Walker Art Gallery in Liverpool. In 1887 his work was chosen for inclusion in the Royal Jubilee Exhibition at Old Trafford in Manchester. ​of powerful black and white drawings, each taking only three or four minutes. On another occasion, at the same venue, he produced an elaborate monochrome seascape in half an hour, to the amazement of actors Sir Henry Irving and Barry Sullivan. Ford Madox Brown described Sheffield’s draughtsmanship as unrivalled and he was highly regarded by his contemporaries. There are also examples of his work in major collections such as Tate Britain, Manchester City Art Gallery and Tullie House, Carlisle. ** The two George Sheffield Junior major collectors and loaners were Robert Edmonson and Sir Arthur Crosfield, the Liberal MP for Warrington and a wealthy soap magnate who built Witanhurst, the second largest house in London, next to Buckingham Palace. The painting was completed whilst George Sheffield was living in North Wales. It is a very interesting image in many ways, not least because there is nothing resembling it in the many examples of his work which have been viewed during this research. However, the neoclassical style was popular around this time. Turner, inspired by the great classical landscape painter, Claude Lorraine, produced large neoclassical paintings which George probably viewed. In 1815, for example, he painted The Rise of the Carthaginian Empire, sometimes referred to as Dido Building Carthage, which now hangs in the National Gallery. 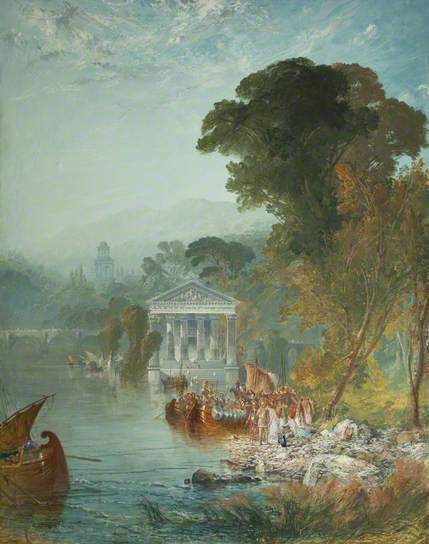 One possibility might be that George was specially commissioned to paint this picture; the setting is supposedly the North African city of Carthage but bears no resemblance to that location. It is more similar to an English Lakeland setting with the addition of neoclassical structures and figures dressed to represent the period when Carthage was a major city in the Roman Empire. The picture does demonstrate very effectively how George could paint with great attention to minute detail, although the composition feels unbalanced. This is somewhat surprising as the painter was known for his 'instinctive feeling for effective light and shade and balanced composition'. Melanie Gardener, Curator at the Tullie House Gallery, suggested that the painting might have been cut, probably by the artist himself, as the signature appears on the left hand side where the lack of parity seems to stem from. Of ship, or tower, or sea. As calm as a child at sleep. A castle stormed in the night. In colour, or black and white. He once made a picture with slutch. To go painting among the stars.